“No” is an important word for our young children to hear and accept when it is used to help create safe spaces for them and promote healthy relationships with others. Offered in a mindful way by adults, “no” communicates boundaries and helps growing children feel securely contained and looked after. Sometimes, however, because of our own issues with the word “no,” we use it in ways that don’t serve our children, or we don’t use it and similarly penalize our children. Below are three tips for using “no” for the best and highest good. Use “no” sparingly and appropriately. 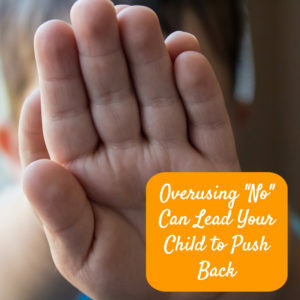 Overuse of “no” or using it for unnecessary reasons, leads children to feeling overly coerced and provokes their instinct to push back (which then sets us up for a battle). Saying “no” too frequently also shuts down exploration which is primary way young children learn. Over time these highly restricted children can feel timid or uncertain and may even withdraw or stand back from life unless they are given permission to take part. When limits are necessary, find other ways to meet the need that drove the child’s behavior. While “no” may temporarily stop a behavior, if the underlying need remains unsatisfied, the behavior — or another behavior — will still show up. If there’s something a child isn’t allowed to touch, for instance, look for something similar they can touch. Or you might show them what happens when the thing is touched (the car starts, the stove top heats up, the blade of the blender spins). “No” isn’t necessarily the best way to shape behavior. Because “no” acts as a wall to prevent behavior, it makes it easy for our child to feel thwarted in her impulse to act. You can either replace “no” in it’s “don’t do” form with a message about choices your child can do instead. So “no hitting” becomes “touch gently” or “walk please” can replace “stop running.” While the end result is the same, the “do this” way of communicating gives our child an option they can enact. “No” can be used in ways to help create safety for our children and support the well-being of all those with whom they interact. When its use is truly necessary and we employ “no” in a thoughtful way, our children can benefit both now and as they grow. If this topic interests you, you might enjoy these videos or my Facebook group, the Conscious Moms’ Circle.